Old-style seaside resorts, western fishing villages, awesome natural landmarks, migrating whales and the western terminus of Lewis and Clark’s great adventure—The Pacific Coast Scenic Byway has something for everyone! The Pacific Coast Scenic Byway traces the entire Oregon coastline along Highway 101, bringing travelers to the sea and away again, winding past marshes, seaside cliffs, lush agricultural valleys and wind-sculpted dunes. The northern half of the Byway is marked by majestic temperate rainforests, a rugged, rocky coastline and resort towns that cater to urban dwellers from Portland. The Oregon coast is one of the most photographed regions in the nation. This Byway offers many natural wonders. Sojourners who visit between November and June will want to scan the horizon to catch a glimpse of migrating gray whales. Several rock formations are home to large colonies of seals and sea lions, and shorebirds abound in the countless estuaries. This Byway also offers many outdoor recreational opportunities, from salmon fishing in the Pacific or coastal rivers to riding an off-road vehicle in the dunes. Plentiful parks and public lands offer access to many hiking trails. Thanks to a landmark Oregon law all beaches are open to the public, making the Oregon coast The People’s Coast. For many visitors, beachcombing for shells (and perhaps even a glass fishing float) in a quiet cove as the sea breeze blows and the waves crash is about as good as it gets! Your Pacific Coast Scenic Byway adventure begins in Astoria, at the northwest tip of Oregon. Astoria, named for the fur trader John Jacob Astor, was the first permanent European settlement in the Pacific Northwest, established in 1811. The town has a rich Scandinavian heritage, which is celebrated each June at the Scandinavian Midsummer Festival. Astoria has a number of attractions, including Fort Clatsop National Memorial, the Flavel House Museum (a splendid Victorian mansion built in 1885), the 125-foot tall Astoria Column and the Columbia River Maritime Museum, home to one of the nation’s finest displays of model ships and nautical artifacts. Down Highway 101 is Seaside, a popular beach resort known for its promenade. A few miles south of Seaside you’ll reach Cannon Beach, a charming community known for its art galleries and seaside vistas. Haystack Rock, a 235-foot monolith, towers over the beach and is one of the state’s most photographed natural wonders. The Byway hugs the coast for the first few miles out of Cannon Beach, climbing to 700 feet above the Pacific; nowhere else does the Byway offer such an elevated ocean view. The road then drifts slightly inland to Tillamook, Oregon’s unofficial dairy capital. Much of the county’s annual milk production of 25 million gallons is made into natural cheddar cheese. Cheese aficionados will want to stop at Oregon’s largest cheese factory for a tasting tour or visit any of several “boutique” cheese purveyors. Historic downtown Tillamook offers good shopping, antiquing and several restaurants. If it’s salmon season (spring and fall), anglers may want to book a charter trip out of Tillamook Bay. After wending through deep forests, the Byway returns to the coast just north of Lincoln City. The wind can really blow in these parts and kite flyers have learned to take advantage. In fact, Lincoln City was recently recognized by Kite Lines magazine as the best place to fly a kite in North America. Just south of Lincoln City you’ll reach Depoe Bay, the world’s smallest navigable harbor and a departure point for fishing and whale watching excursions. A few miles south, a short side trip on the Otter Crest Loop brings you to some of the coast’s most photographed seascape—Devil’s Punchbowl and Cape Foulweather. Devil’s Punchbowl is a collapsed cavern that churns with seawater at high tide. Cape Foulweather, perched nearly 500 feet above the pounding surf, offers spectacular vistas of towns up and down the coast. Next, you’ll reach Newport, one of the north coast’s most popular vacation spots. Still a working fishing village, Newport boasts a historic bay front, an ample accessible beach front and many shops and restaurants. In the southern part of town, visit Yaquina Bay Lighthouse. The Oregon Coast Aquarium and Mark O. Hatfield Marine Science Center are “must-see” stops. The Byway hugs the coast, passing through the small towns of Waldport, about halfway down the coast, and Yachats. Just below Yachats you’ll come upon Cape Perpetua, which towers 800 feet above the Pacific, and a narrow shoreline channel called Devil’s Churn. Cape Perpetua is an exquisite natural landmark which encompasses tide pools, ancient spruce forests and piles of discarded shells—some as high as 40 feet—that bear testimony to earlier Native American habitation along the coast. The next wonder is manmade—Heceta Head Lighthouse, Oregon’s most powerful beacon. Past Heceta Head, you’ll soon reach Sea Lion Caves, one of the world’s largest sea caverns, and home to wild sea lions year-round. A high-speed elevator transports spectators to an observation deck from which hundreds of sea lions—some more than 1,200 pounds—can be viewed. In Florence, billed as the City of Rhododendrons, enjoy the bright blossoms in the spring and tour the recently restored historic district at the mouth of the Siuslaw River. South of Florence the rugged coastline gives way to 47 miles of gently rolling dunes that extend nearly to Coos Bay—the Oregon Dunes National Recreational Area. The mounds of cream-colored, ever-shifting sand were created over millions of years as sedimentary rock from nearby mountains began to erode and particles were carried to the ocean. In time the particles became sand and were washed inland by the tides. Jessie Honeyman State Park is an excellent spot to wander the dunes. Nearby Reedsport hosts the Oregon Dunes National Recreational Area Visitor Center. Reedsport is also home to the Dean Creek Elk viewing area, a thousand acre preserve where approximately 100-150 majestic Roosevelt Elk roam freely. The neighboring cities of North Bend, Coos Bay and Charleston—collectively known as the Bay Area—comprise the Oregon coast’s largest urban area. With the largest natural harbor between Seattle and San Francisco, Coos Bay is a shipping and manufacturing center; North Bend and Charleston are home to active commercial and sport fisheries. Midway between the Bay Area and Bandon is Cape Arago, which is just a short side trip off the Byway. A loop road (part of the Charleston/Bandon Tour Route) takes you through the South Slough National Estuarine Reserve, home to black bear, black-tailed deer, over 150 kinds of birds and many good hiking trails. The loop also leads you past three state parks. Returning to Highway 101, you’ll soon reach the quaint coastal village of Bandon, a popular retreat. Each September, Bandon hosts the annual Cranberry Festival. Bandon is also home to numerous hotels, restaurants and four of the most famous golf courses in the world. An alternative path from the Bay Area to Bandon is the Charleston/Bandon Tour Route, which showcases a glorious stretch of coastline as well as the wildlife areas of Cape Arago. After a splendid sojourn past fir forests, open plains and lush farmlands, you’ll reach Port Orford, a busy fishing center. Anglers visit the region to ply the waters of The Sixes and Elk Rivers for salmon and steelhead. Look for Thousand Island Coast, a rock formation off Port Orford, which is home to many harbor seals and sea lions. Down the coast at Gold Beach, the legendary Rogue River meets the Pacific. The Rogue’s salmon and steelhead were made famous in the early 1900s in articles by western novelist Zane Grey, and today attract fishermen from far and wide. Non-anglers will also appreciate the lower Rogue’s scenery, which can be experienced on a jet boat cruise. The last eight miles of the Byway leading into Brookings offer some of the Byway’s most magnificent scenery, with unobstructed views of the seascape. Because of its mild climate, Brookings is known as the Banana Belt of Oregon. Ninety percent of the country’s Easter lilies are grown in the region. Five miles farther down the road, the redwood forests of California await. There are nine lighthouses along the Pacific Coast Scenic Byway. 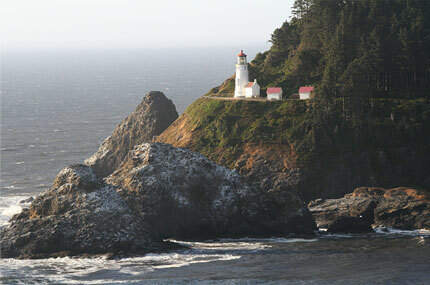 They include Cape Blanco, the light at Coquille River (pictured at right), Cape Arago, Umpqua River, Heceta Head, Yaquina Bay, Yaquina Head, Cape Meares and Tillamook Rock. While each has distinguishing characteristics, lighthouse aficionados are especially fond of the Umpqua River and Heceta Head Lights. Dating from 1894, the Umpqua River Light (south of Reedsport) is 65 feet tall and features an unusual—and some say, mesmerizing—revolving, octagonal, red-and-white lens. Just north of Florence you’ll see Heceta Head, which was also erected in 1894. Resting 205 feet above sea level, Heceta Head is notable for its postcard-like surroundings and its unusually large lens. If you visit in the evening, the Queen Anne-style Keeper’s House serves as a bed and breakfast.